So you want to write a book. Maybe you’re looking for a new revenue stream. Maybe you have a morning routine that you think others should adopt to make their days more efficient. Maybe you’ve had a lot of interesting conversations online lately and want to summarize the ideas you’ve generated from those talks. Whatever the case, packaging and distributing your expertise has never been easier. In fact, some authors have turned down offers from publishing houses in favor of the self-publishing model. If you’re considering this independent route, recognize that its advantages go beyond giving yourself the green light to produce your written work. You also have the freedom to create your own schedule and involve whomever you want in the process. Still, self-publishing can be intimidating. Even if you’re not a first-timer, it’s still a process that requires a tremendous amount of discipline, as several established authors can attest. 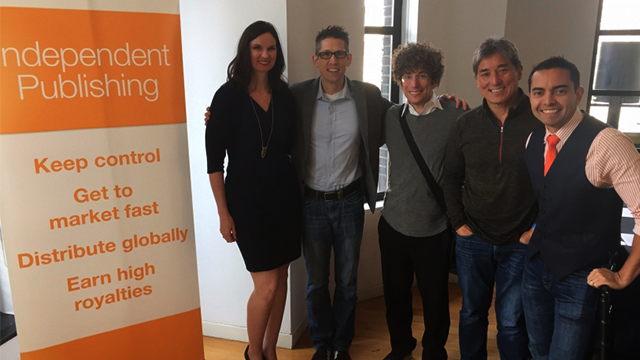 At a roundtable hosted by Kindle Direct Publishing recently, authors James Altucher, Honorée Corder, Hal Elrod, Pat Flynn and Guy Kawasaki shared their tips for successfully writing and promoting a self-published book. 1. Know why you want to write a book in the first place. Is a book a means to an end, or an end in and of itself? “Your agenda might be not to sell a million copies, but to get speaking gigs, or to get consulting work, or to build a bigger email list or to sell other books based on this one book that you’re self-publishing,” said Altucher, an entrepreneur, podcaster, trader, investor and author. Business coach Corder, author of You Must Write a Book, shared a similar view about the power of being published and the doors it opens. Kawasaki, describing his view as “slightly contrarian,” emphasizes the importance of having a passion for the information you’re sharing and the value it adds. Before you write, determine where your motivation lies so that you can position yourself to get what you intend out of the publishing process. Also note that some of the opportunities that arise from being an author, such as the ability to raise your speaking fees, may come as a byproduct of putting forth your ideas. 2. Figure out your timeline and schedule. Block out time, whether it’s a couple of hours every day or a period of days or weeks. When he set out to write Will It Fly?, he made an effort to get ahead on his other projects, such as his blog and podcast. Then, he wrote the book exclusively between 5:30 and 7:30 a.m. This time limit led Flynn to think about productivity and efficiency in his writing. He hired a coach to help him overcome roadblocks such as self-doubt and to increase his speed. He dictated his entire first draft through an app called Rev, which records audio and then exports it for human transcription. Through stream of consciousness, he completed a first draft at 300 words per minute that contained far richer, honest ideas than that he likely would have filtered out before writing them down. Elrod, who proudly wakes up at 3:30 a.m. every day as part of his Miracle Morning regimen, has also done some writing in the wee hours. But over the years, he’s taken various approaches, such as when he wrote his first book in 2006 while working in sales. “I would lock myself in a room and drink coffee, and I would write for 12, 14 hours a day for a week and get a third of the book done,” Elrod said. 3. Adopt an “It takes a village” mentality. Just because you’re self-publishing doesn’t mean you have to be a jack of all trades. You can hire an editor, a proofreader, a graphic designer and a marketing agency so that you can focus on the writing itself. “Make sure that you’re making it as traditionally published looking and sounding and feeling as you possibly can,” said Corder, who is also Elrod’s business partner on the Miracle Morning series. You can also recruit volunteers. “I take my book, and I write in Word, and when I think it’s about to go to copy edit, I post on all of my social media about the fact that it’s in beta, and I’m looking for testers,” Kawasaki said. “Then I send everybody a copy of the manuscript. Literally thousands of people. And of the thousands, I would say 20 percent actually send corrections back." Kawasaki says he doesn’t worry about this large-scale digital distribution jeopardizing his sales. He repeats this process once the book is about to be published, sending PDFs to volunteer reviewers. Then, hours before the book goes live, he sends an email to everyone who has read it, asking them to write an Amazon review at midnight Pacific time. “In the first 48 hours, you need to get 40 or 50 reviews that average five stars,” Kawasaki said, explaining that this is a key way to give your book momentum. His method allows him to get honest reviews from people who have actually read his book – the first time he did it, he even called Amazon to reassure the company that he was not gaming the system. Corder and Elrod said they have what’s called an “Advanced Reader Team” for The Miracle Morning series. They too send books to hundreds of people ahead of publication to collect feedback and inspire reviews. 4. Offer peeks behind the scenes as you work. Flynn suggested another strategy for generating feedback and drumming up excitement before a book launches – and sometimes even before he’s started writing. He has posted YouTube videos with callouts to viewers, asking them to help him brainstorm for his book and hone its focus. He also posted one video in which he demonstrated the aforementioned Rev dictation app. Another great way to engage potential readers early on is to poll them on various cover design options via social media. Elrod said that he received 2,300 Facebook comments when he did this. 5. Balance storytelling with actionable advice. If you consider the advice you might give someone, chances are there’s a story behind each lesson. Even though you’re not writing a novel, you can leverage storytelling to drive your message. A story evokes emotion, Elrod explained, quoting Maya Angelou: “People will forget what you said and what you did, but they’ll never forget how you made them feel.” He said he strives to make his books fun and entertaining, but also suspenseful like a movie. That way, people won’t want to put the book down. But entertainment shouldn’t come at the expense of helping readers with their own self-improvement. “If you don’t change behavior, then all they are is inspired and entertained while they read your book,” Elrod said. 6. Consider recording an audiobook. If you think that not many people listen to audiobooks, you’ll be surprised to learn that both Altucher and Flynn said that’s how they make most of their money from their books. You might be uncomfortable reading your own book aloud, but you can always hire a narrator, as Corder does. Or, you can record an “abridged version,” as Altucher did with Choose Yourself. “I went into the studio, and I said, I can’t just read off this book, it feels really fake,” Altucher said. So instead, he didn’t read the book verbatim. The distributed recording even includes him asking the audio engineer questions. He said that because it’s not identical to the book, people buy both, which earns him more money. Flynn decided to record an audiobook because he already records a popular podcast. He and Altucher both emphasized the importance of going into a professional studio to record, even if you have equipment at home. You’ll get finished faster without say, kids to distract you, and the product will be of higher quality. The typical trajectory for self-published book sales is that they peak within the first month, then drop off, according to Elrod. That was the case with The Miracle Morning. To pull his sales out of that post-first-month slump, Elrod promoted the book relentlessly. “It took a year and a half of doing over 100 podcast interviews for the sales to get back to where they were,” he said. Eventually, if you get invited to promote your work on a prominent platform, you’ll see the return on all of your investment. The reality for self-publishers, Elrod said, is that you have to “promote until you die.” Traditional publishers, Kawasaki noted, will give up on your book after five weeks if it doesn’t take off. But if you believe in the words you’ve written, he said, you’ll be more apt to persevere.